The AR.5 is a bottle opener designed to look like a miniature AR-15 lower receiver, manufactured by Arizona-based Nelson Precision Manufacturing. 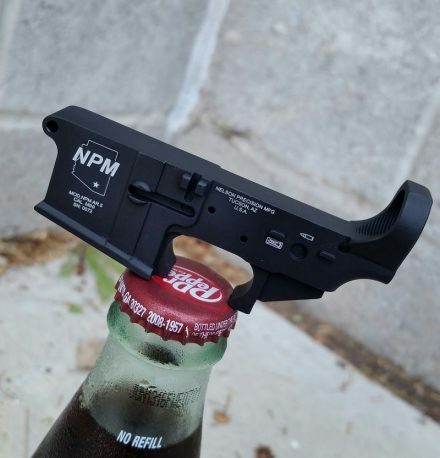 Machined from 6061 aluminum and Type III hard coated black anodized, the AR.5 Bottle Opener is detailed very much like an actual lower receiver, with the trigger guard pin extensions functioning as the bottle opening tool. 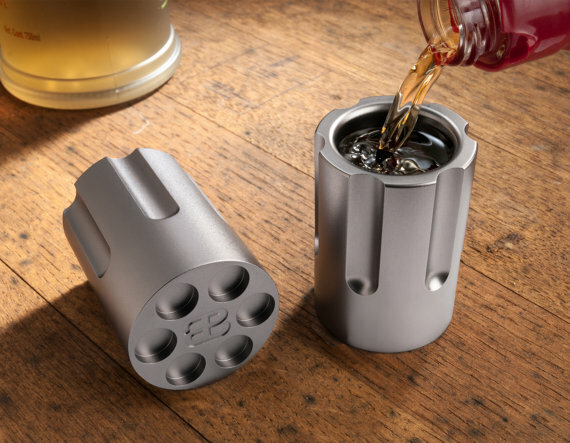 Plus, if the product images are anything to go by, each bottle opener is individually serialized, which is pretty neat. Have you ever imagined various fast food mascots as elite operators in a special forces unit called Meal Team Six? However, We Like Shooting has, and they’re releasing a limited weekly patch run of that very concept. This first set stars Burger King’s ‘The King’ as the flamethrower and molotov-wielding operative known by the codename King. This particular set consists of two patches and two stickers, the first design a depiction of the Operator ‘King’, and the second a design more reminiscent of The King’s normal appearance, molotov and spatula in hand. 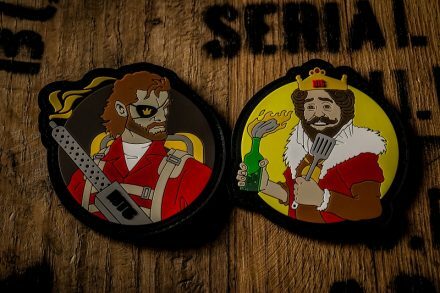 Honestly, operator King looks to me like an amalgam of two of Kurt Russell’s greatest rolls: MacReady from The Thing (because of the flame thrower and hair), and Snake Pliskin from Escape from New York (because of the eyepatch and hair). As a film, Starship Troopers is a terrible adaption of the Robert A. Heinlein novel of the same name, but stands on its own as an entertaining movie, and more importantly, for its oft-quoted and memed in-universe propaganda segments. 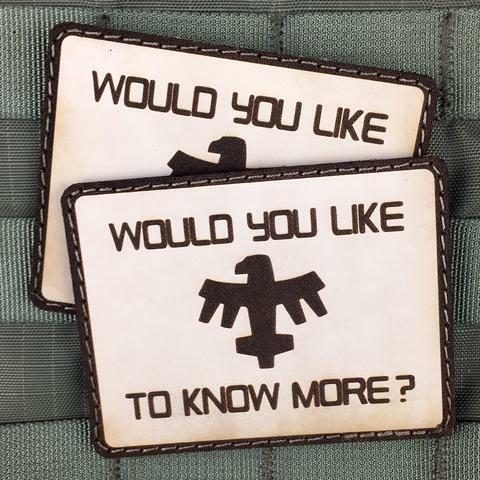 Such is the inspiration for VLMS’ “Would You Like To Know More?” morale patch, which features the quoted phrase, along with the United Citizen Federation logo. 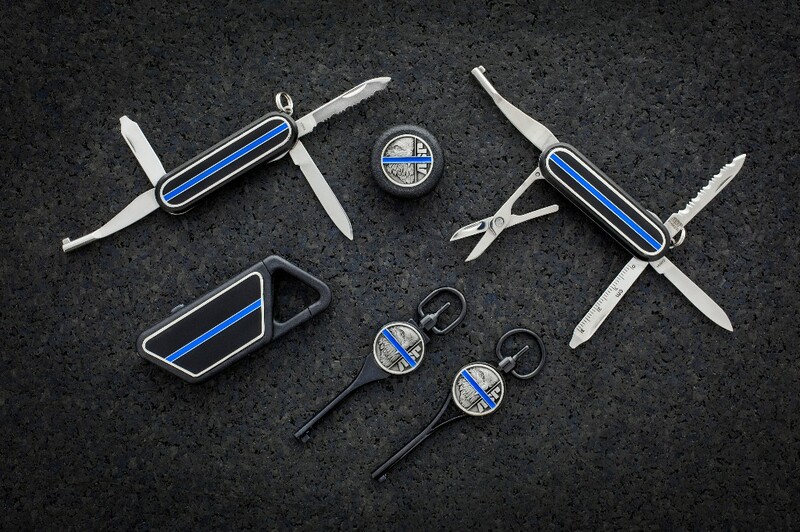 Sized 2.5″ x 3.25″ inches, leather, and Hook Velcro backed. Because the original file was removed, here’s a low-quality replacement. 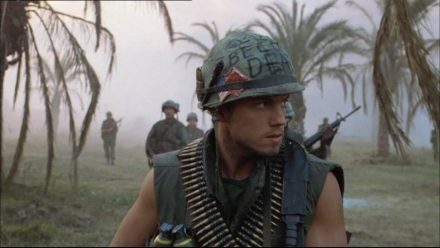 Posted in Morale | Comments Off on Happy 4th Of July Everybody! Unless you’ve lived under a rock, you’ve heard of America’s former arch-nemesis Osama bin Laden. You’ve also likely heard of Mystery, Incorporated, the stars of ‘Scooby Doo’ who gained fame via a half-century of solving mysteries in their groovy mini-van. 30 Seconds Out commemorates one of the greatest operations in US military history, by reminding us of those meddling kids. 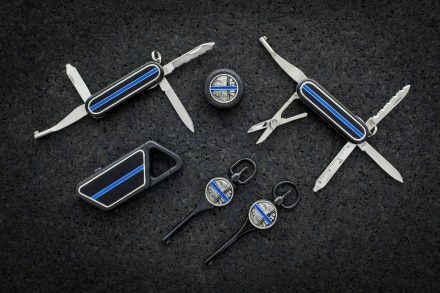 Tactical Outfitters has began accepting pre-orders for what they claim will be the world’s largest morale patch, supported by an application to Guiness World records. A 1:1 sized replica of the Swedish AT4 anti-tank launcher, this patch will be 40″ long by 6.22″ wide, and fully Velcro backed. This will be a limited-time offer, and purchasers will also receive a numbered art card with every pre-order customer’s name on it. Additionally, a portion of the proceeds from the sale of the AT4 Morale Patch will be donated to Wishes For Warriors. Happy 243rd Birthday US Army! Happy 243rd Birthday to the US Army! Also, Happy Flag Day, and Happy Birthday to the POTUS! Posted in Morale | Comments Off on Happy 243rd Birthday US Army! Since the beginning of our nation, men and women have given their lives in defense of their fellow citizens. Today, we honor their sacrifice. Take a moment to share your memories of our fallen brothers and sisters. From May 24 to July 4, 2018, U.S. veterans and up to three guests may enjoy free admission to SeaWorld Orlando, SeaWorld San Antonio, SeaWorld San Diego, Busch Gardens Tampa Bay or Busch Gardens Williamsburg. Veterans must redeem their complimentary single-day ticket(s) online at www.WavesofHonor.com, and the free tickets are available online only (not available at the front gate for each park). Since SeaWorld Parks and Entertainment started the Waves of Honor program in 2005, more than 9 million active military, veterans and their families have visited the parks for free, which represents an estimated value of $300 million. •	Electric Eel at SeaWorld San Diego: The tallest, fastest roller coaster in San Diego is here—a multi-launch coaster with high-energy twists, electrifying loops and inversions. Launched on May 10, Electric Eel features accelerations of more than 60 miles per hour in a matter of seconds, rocketing riders skyward nearly 150 feet where they’ll brave an inverted “heartline” roll and a twisting loop for an exciting feeling of airtime as they reach the peak of the coaster before breathlessly returning to the station. Complementing the Electric Eel roller coaster is a hypnotizing live eel habitat featuring a collection of moray eels. The eel habitat, located at the edge of the Ocean Explorer realm already part of SeaWorld, features large viewing windows where guests can plunge into the world of the eel as they swim and dart through the caves and crevasses of their naturalistic deep-ocean environment. Both rider and non-riders can also learn about the elusive eel through an interactive game and an exhibit with real California moray eels. Plus, SeaWorld San Diego have partnered with WILDCOAST to raise awareness for Marine Protected Areas (MPAs). Guests will be able to learn more about MPAs and the importance of protecting ocean ecosystems in the habitat. •	Battle for Eire at Busch Gardens Williamsburg: An exhilarating new adventure is underway at Busch Gardens® Williamsburg with the recent opening of the innovative virtual reality attraction, Battle For Eire™—Action VR Ride. With Battle For Eire and the 360-degree virtual reality, riders can have a unique experience each time they ride. Battle For Eire is the story of a heroic fairy warrior, Addie, and her quest to rescue the Heart of Eire from evil villain Balor. This one-of-a-kind ride is a marriage of a motion-based theater simulator with state-of-the-art 360-degree virtual reality headsets, creating a thrilling experience unlike any other in the theme park industry. Riders are completely immersed within the story and be able to see, hear and feel actions happening all around them, both through the virtual reality headsets and within the motions of the simulator. •	Electric Ocean at SeaWorld Orlando, San Antonio and San Diego: Enjoy 8 amazing experiences, including shows with live performers inspired by playful sea creatures, an electrifying dance club with world-class DJs, and your favorite SeaWorld attractions and shows like never before – all at Electric Ocean, an exciting nighttime event. The event is returning this year to SeaWorld Orlando (May 24 through September 2) and San Diego (June 16 through September 3) and is brand new to SeaWorld San Antonio (June 15 through August 12). •	Free Beer at SeaWorld Orlando: Now through September 2, from 10:30 a.m. to one hour before park close, complimentary domestic and seasonal beers will be available to guests 21 years of age and older. Guests can visit Mama’s Pretzel Kitchen Patio and receive up to two complimentary 7-ounce beers per visit. The park will rotate beer offerings throughout the summer starting off with SeaWorld’s very own Mako Red Ale. Bud Light, Coors Light, Miller Light, Yuengling and more will also be featured throughout the summer. •	Free Beer at Busch Gardens Tampa: Now through August 5, guests can get a taste of the park’s beer garden history when they visit the former Hospitality House, now called the Garden Gate Café, to receive two complimentary beers during every visit to Busch Gardens Tampa Bay. Every two weeks, new featured beer brands will be highlighted. •	Summer Nights at Busch Gardens Tampa: From May 24 through August 5, guests can experience endless energy and thrilling rides from day into night. As the sun goes down, the party heats up at Busch Gardens Tampa Bay during Summer Nights. Explore the park after dark with extended park hours to 10 p.m. on select days. Dance the night away at themed party zones throughout the park and take on Florida’s top thrill rides in the dark. Plus, indulge in delicious food like steak chimichurri, chicken waffle sandwich with blackberry pepper jelly, smoked beef brisket sliders with peach slaw, hummus topped with curry-roasted cauliflower, chilled shrimp with watermelon & tamarind glaze, mini donuts, funnel cakes and more, with special Summer menus. WILLIAMSBURG, Va. (May 17, 2018) – Colonial Williamsburg honors American military service Memorial Day weekend May 25-28 with free admission tickets for active duty military, reservists, retirees, veterans, National Guard members and their immediate dependents thanks to a $100,000 grant from The Home Depot Foundation. Tickets issued through the Honoring Service to America program include admission to dozens of Historic Area sites including iconic attractions and trade shops plus historic gardens, interpretive programs and the Art Museums of Colonial Williamsburg. The program has distributed more than 28,000 tickets since 2014 and is part of The Home Depot Foundation’s philanthropic mission to improve the homes and lives of service members, veterans and their families. Service members need not be present for qualifying guests to receive free Honoring Service to America tickets, which are provided to dependent family members of currently deployed troops with appropriate identification. Veterans who separated before retirement can bring a copy of their honorable discharge paperwork, form DD 214, as identification of service. These weekend-long admission tickets are available at all onsite ticketing locations. A Memorial Day commemorative service will be held from 10 a.m. to noon on May 28 to honor fallen service members. A procession with the Colonial Williamsburg Fifes and Drums and Military Programs staff will begin at the Governor’s Palace and proceed to Bruton Parish Church, ending at the Capitol. Remarks, placement of wreaths and ceremonial musket volleys honor soldiers of the American Revolution, the Civil War and other conflicts. This service is free and open to the public. Military guests and their families are encouraged to stop by Colonial Williamsburg’s new military information desk at the Colonial Williamsburg Regional Visitor Center and the Liberty Lounge, a complimentary space for ticketed military guests to relax and recharge in the Historic Area. In addition to complimentary and discount admission for military families year-round Colonial Williamsburg is proud to offer military discounts on all Colonial Williamsburg hotels, dining, retail, golf and spa. For more information about “Honoring Service to America” tickets and program, telephone 855-296-6627 or visit www.colonialwilliamsburg.com/military. More information is also available by following Colonial Williamsburg on Facebook and @colonialwmsburg on Twitter and Instagram. Posted in Morale | Comments Off on Happy Mother’s Day! 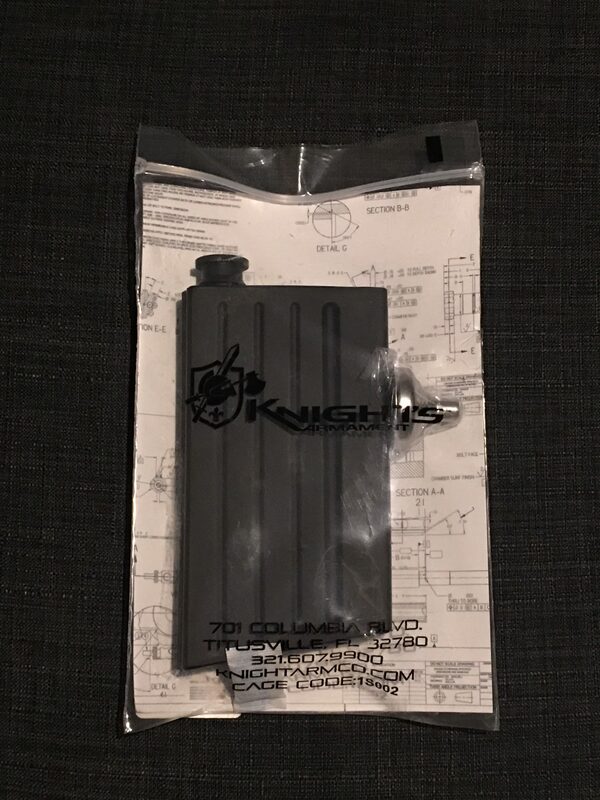 I picked up one of Knight’s Armament’s SR-25 Magazine Flasks at their booth at the recent NRA Annual Meetings show. 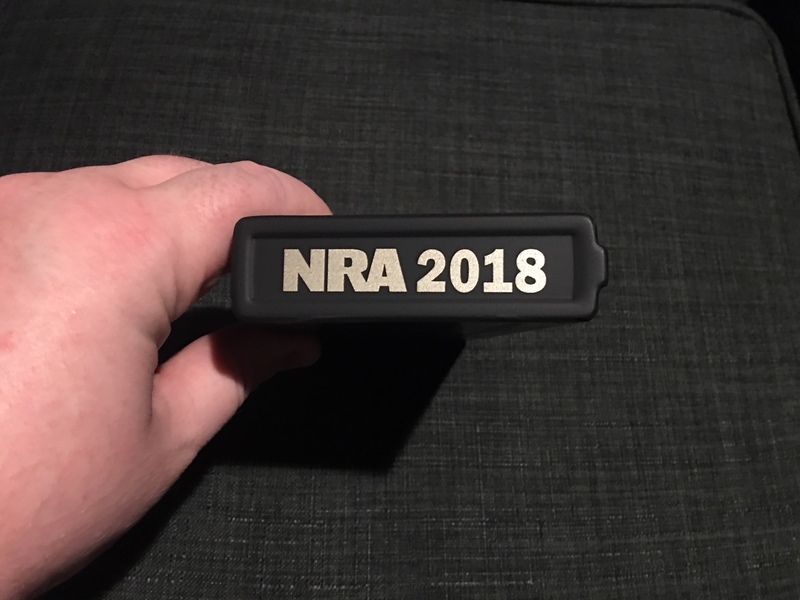 Modeled after the dimensions of the SR-25 magazine, this flask features a slick black finish, an included funnel, and ‘NRA 2018’ is marked on the bottom. We made it through another year. Here’s to 2018! Posted in Morale | Comments Off on Happy New Year! Posted in Morale | Comments Off on Merry Christmas and a Happy New Year! Posted in Morale | Comments Off on Merry Christmas! 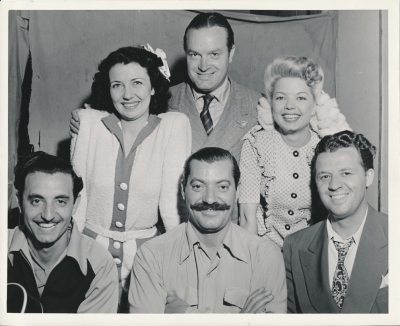 And with that, on Dec. 23, 1947, Bob Hope and Les Brown and his Band of Renown began to entertain hospital staff, guests from the community and Hope’s target audience, the patients – Sailors and Marines – many still recovering from World War II. Hope and his cast entertained with a half-hour of jokes, jibes and rapid-fire banter during his popular NBC radio show, broadcast from the auditorium in the Naval Hospital, the former luxury Norconian Resort Hotel where Hope vacationed years earlier. And thanks to a decade-long search, the public will get to hear the entertaining show on the 70th anniversary of its first broadcast when the Navy will stream it live on Facebook, Saturday, Dec. 23, at 7 p.m. – its original broadcast time on the West Coast. It also features announcer Wendell Niles, Vera Vague, Jerry Colonna and singer Frances Langford. The historic recording is part of Naval Surface Warfare Center Corona’s capstone celebration for the Navy’s 75th anniversary in the Inland Empire. When it goes live on Facebook, facebook.com/NAVSEACorona, it is likely the first time the show will have been broadcast since it originally aired on the NBC Radio Network in 1947. Hope was familiar with California’s Inland region, making his first USO show May 6, 1941, at March Field in nearby Riverside, now March Air Reserve Base. March’s program was Hope’s first remote broadcast and paved the road for Corona’s performance years later. Based on these appearances and prior visits to the Norconian, the warfare center’s public affairs director and historian, Troy Clarke, said he has been trying to obtain evidence for the past 10 years that Bob Hope came to the Navy base when it was a hospital. “I always suspected it, but not until 2010 were we able to obtain a photo of Bob Hope from the USO that identified the location as Corona,” Clarke said. Clarke and command archivist, Aida Cuevas, continued to dig. Cuevas found proof of the Corona show in the extensive Library of Congress collection of Hope’s body of work. After more than a year, Clarke and Cuevas finally received NBC’s permission to obtain a digitized version of the original lacquer-disc recordings. Clarke said he’s been working for months to play the recording publicly on its 70th anniversary and the final permissions from NBC and the Bob Hope estate Dec. 20. Cuevas discovered Hope performed three other shows around Southern California that December of ’47, including a Dec. 9 appearance at Occidental College in Los Angeles, and a Dec. 16 show at the Fox Theater in Pomona. On Dec. 30, Hope broadcast his show from Pasadena City College featuring the coaches of the Rose Bowl football teams. Among these programs, Clarke says research of the Nielson Radio Index indicates Hope moved from a sixth-rated show in average audiences to second in popularity after the Corona broadcast – seemingly his highest rated show of December 1947. 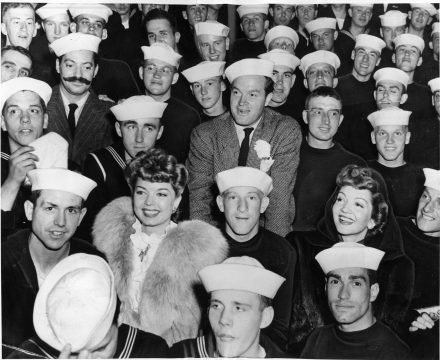 On Christmas Eve, the Corona Daily Independent published its account of the show and reported the auditorium was packed to capacity, with Sailors and Marines confined to wheelchairs being placed in “favored” spots before the stage. The paper wrote that once the show completed the weekly broadcast at 7:30 p.m., Hope continued the show for nearly an hour, telling commanding medical officer Capt. J.W. Vann – whom he said he recalls seeing overseas – that he’d like to make another broadcast from the hospital soon. The paper reported that the versatile Hope also performed several soft-shoe and tap dance numbers. At the conclusion of the Navy’s 75th year in the region, Dec. 15, Clarke played excerpts for the warfare center workforce in the command auditorium where Hope may have visited patients when he returned for later, non-broadcast show in 1952. The auditorium was the theater for the hospital’s tuberculosis ward that opened in 1943 and now houses workspace for the Navy’s current science and engineering mission on the property. The discovery of the Hope broadcast adds to the Navy’s rich legacy in the Inland Empire. In the months and days preceding the Dec. 7 Japanese attack on Pearl Harbor, the Navy had been investigating buying the Norconian Resort to use as a hospital. Days before the attack, the Navy’s medical team conducted its final evaluation, and within hours of the attack, Capt. Frederick Conklin arrived at the hotel to advise its owner, Rex Clark, that the Navy was taking over the property. By direction from President Franklin D. Roosevelt, the Navy acquired the property and officially designated it Corona Naval Hospital Dec. 16, 1941 Conklin would later present Lt. John F. Kennedy with the Navy-Marine Corps medal for heroism during World War II. Among Corona Naval Hospital’s first patients were Pearl Harbor survivors – one of whom, Donald Stratton, recently told his story aboard USS Arizona in the New York Times-bestselling book, All the Gallant Men. Another was James Leavelle – who later became the Dallas homicide detective who interrogated President Kennedy’s assassin, Lee Harvey Oswald, to whom he was later handcuffed when Jack Ruby shot Oswald. Corona Naval Hospital housed an extensive medical staff throughout the war, providing medical treatment for some 5,000 patients at its peak. As treatment concluded following World War II, it closed in 1951, reopened to support the Korean War, and finally closed in 1957. The science and engineering mission that began for guided missiles in 1951 continues today at its original site and, along with new state-of-the-art facilities, has developed into the Navy’s premiere independent assessment and analysis agent that help warfighter’s train, fight and win. Headquartered in Norco, the warfare center has some 3,200 military, civilian and support contractors around the country. ‘Tis the Season once again, and LA Police Gear has the ugly Christmas sweater covered, with a ‘tactical’ twist. 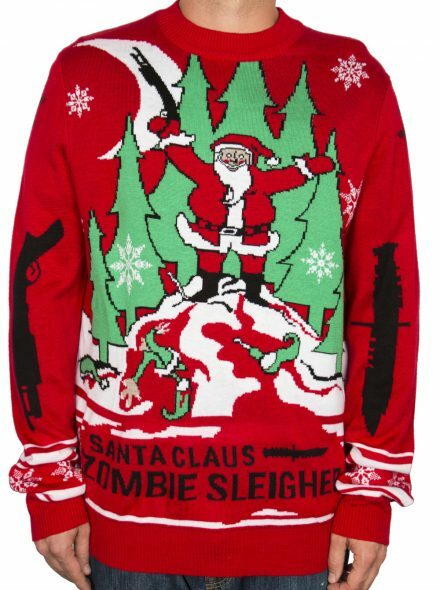 This particular sweater, titled ‘Zombie Christmas’, depicts St. Nick slaughtering the zombie elf horde, although other designs such as ‘Oh Deer’ and ‘Santa Droppin’ Bombs’ is also available. The sweaters are made of 100% acrylic material, and come in sizes S-XL, when available. Thirty Seconds Out is now doing a line of ties, starting with a tie featuring their ‘Doing>Talking’ design. 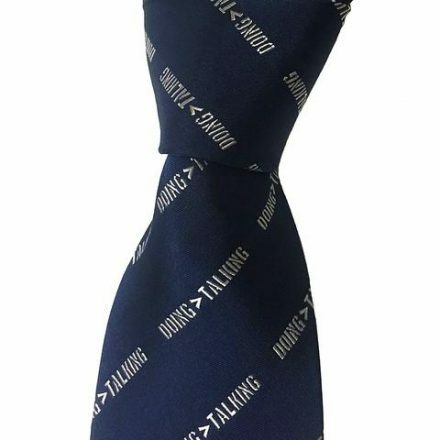 The tie is made of 100% silk, Navy Blue in color with Silver text. This is a limited run, so grab one quick if you’re interested.